In 1937, the Congress passed the first significant national housing legislation. The Housing Act of 1937 allowed states to pass enabling legislation to create local public housing authorities. In July of 1962, twenty-five citizens of the Town of West Warwick petitioned the Town Council stating “the necessity for a housing authority in the town.” The Town Council directed the Town Clerk to schedule a public hearing for August 28, 1962 to hear from the citizens of the city. At the public hearing on August 28th, several speakers spoke about the need to create a housing authority to provide decent, safe and sanitary housing for elderly residents of the town. Speakers included: Dr. Harvis Wolf, the chairman of the Committee on Housing for the Elderly; Dr. Mary Mulvey, Administrator of the Division on Aging; Earnest Friday, Chief of Planning for the R.I. Development Council; and several Town Councilmen, State Senators and Representatives. All spoke in favor of creating a housing authority. Immediately after the public hearing, the Town Council passed a resolution declaring a need for a housing authority. 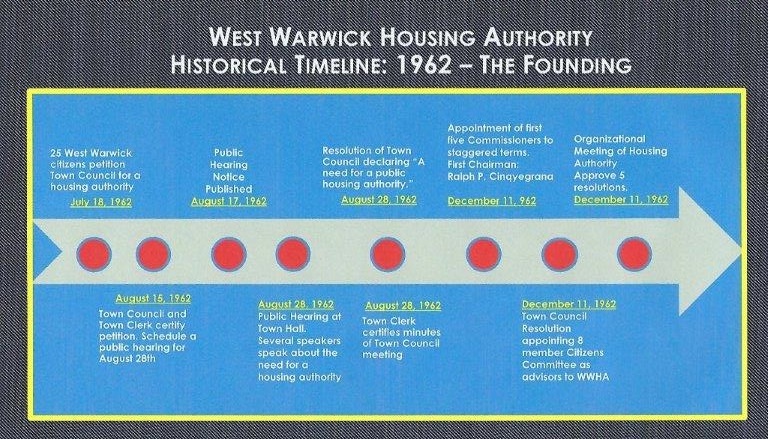 On December 11, 1962, five citizens were appointed to the first Board of Commissioners of the Town of West Warwick Housing Authority. The board’s first chairman was Ralph Cinquegrana. Renee R. Dionne, one of the first commissioners (appointed for one year) became its first Executive Director on September 22, 1964. The West Warwick Housing Authority’s first development – West Warwick Manor – was constructed in 1964. The housing authority’s second development – Clyde Tower – was constructed in 1971 with a substantial addition completed in 1984.